Fancy playing your instrument with other musicians? Aged 5 to 18? Enjoy a variety of classical and modern music? Then the Coffs Con Youth Orchestra could be for you! 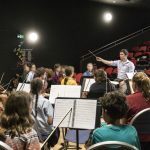 Formed in 2017, the Coffs Con Youth Orchestra is conducted by our Artistic Director, Patrick Brearley. Our Youth Orchestra plays an assortment of classical and modern works by various composers, graded to suit the level of the players. And fun film music is added to keep your toes tapping! The Coffs Con Youth Orchestra perform at least once per term and are supported by The Academy. This provides a tiered learning system with the more advanced Academy students performing alongside the Youth Orchestra students. Rehearsals are on Thursdays from 4pm – 5pm. To enquire about becoming a member, please call the office on 6652 1592 or send us a message. Also, make sure you check our other ensembles. We have many options for Coffs Harbour musicians who would like to join a band (including guitar ensembles, Coffs Con Studio Band, The Academy, etc).